I’ve been thinking about the Wi-Fi to [computer] thing, and I really doubt Fujitsu is going to do it. The reason I think that is because I would imagine that they would be afraid of it cannibalizing sales of their network scanners, or might reduce the sales to offices. So, I would be very surprised if they end up adding the ability to scan to a [computer]. That uninformed person was, of course, me. Today Fujitsu has dropped a massive firmware and software update to the ScanSnap iX500 that adds the ability to do wireless scanning to a Mac or Windows computer. I almost fell out of my chair when I saw the update come through. If you aren’t automatically notified of the update, right-click on the ScanSnap icon in your Dock (for Mac users) or System Tray (for Windows Users), go to Help and then Online Update. Once you do that, it will take you through the update process. You do need to have the iX500 plugged in via USB to set it up. As I mentioned, the computer needs to be initially plugged in via USB to set it up for wi-fi scanning. As you are going through the software installation, it should automatically start the ScanSnap Wireless Network Setup wizard. ScanSnap Do You Want To Connect Wirelessly? Once it has been set up, you will see that your Dock icon on the Mac or your System Tray icon on Windows now has a little wi-fi signal. Now it’s time to unplug the cord! Take out that USB cable, put some paper into your scanner, and hit Scan. As long as you are on the same wireless network, and as long as the Wi-Fi switch is on at the back of your scanner, it should find your computer and scan to it using whichever ScanSnap Manager profile you had specified (or the Quick Menu if you roll that way). The way the ScanSnap iX500 wireless scanning works, the scanner is “paired” to your computer. If you want to scan to multiple computers, it is doable but not super seamless. I’ll cover that in a future post. Here is how to change the computer that the iX500 scans to. Many people felt that to this point, the iX500 didn’t have “true” wi-fi scanning because it only worked with mobile devices. Wireless scanning to a computer was by far the most requested feature from what I’ve seen. That feature is now here. Let me know how it works for you. So far, so good for me. 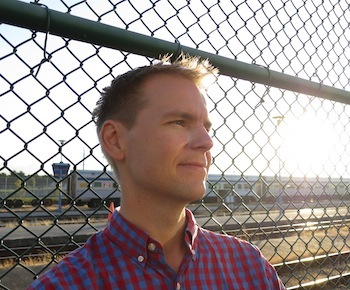 My wife says that I am wrong all the time – I’m just happy it is about scanning for a change. I am trying to set up the scansnap ix500 to my Microsoft surpace. Is there a way to do it without connecting to a usb? I do not have usb port. I was able to scan via Wi-Fi all the time, even after changing internet providers / routers and updating all the info. Then one day out of the blue, I was scanning fine, and then scanning my next batch and it wasn’t working. Connect it via USB cable and it scanned fine…unplugged it again, and it won’t scan…plug it again, scan fine, unplug and won’t scan. Tried turning off the scanner and computer, still not working wirelessly. Turned off the Wi-Fi option and turned it back on, still not working. I am not about to uninstall and reinstall because honestly that takes too much time, and I don’t have a CD-drive to do via CD and doing it online usually gives me problems before I can figure out how to do it, so I honestly don’t want to go the uninstall and reinstall route if I can avoid it. I don’t know how to do what some of the other suggestions on here were, such as checking to make sure the network is reading the same, but I am assuming it is, because it will scan wirelessly to my android phone. Any other suggestions? I’m using Windows, but had the exact same problem after changing routers. I had to connect using the USB to scan, even though I had the blue WiFi light on and pressing it did nothing but flash four times. 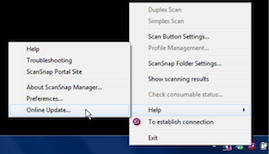 Workaround….right click ScanSnap icon and select Duplex Scan and bingo, it scan wirelessly. I emailed Fujitsu. Within 30 minutes I got a response with a solution that WORKS! This is most likely a Firewall blocking the Signal from the scanner to start a scan. Can you try the following steps to allow the Manager through the firewall. Subject: ScanSnap IX500. Windows 10. Scan button just flashes a few times but does not feed paper when trying to scan wirelessly. It will feed paper and scan if I go to system tray and click DUPLEX. The IX%)) scan button also feeds paper and scans when connected via USB. Oh my goodness, this DID work! I just wish I saw your post about 9 1/2 months ago, but better late than never! I appreciate you sharing what worked for you. I know’ I’ll be boring, but….please Fujitsu, let us to REALLY share this device. I mean, it’s very clear Fujitsu is doing what they can in order to avoid a single IX500 to be used computerless by (for example) a small workgroup. – share through network (cabled would be better, but at least wirelessly) between some computers. All of these limitations are just ‘software’ limitations, but, honestly, I cannot suggest to any of my clients this device because it’s just too much personal. You actually CAN do all those things if you are willing to setup the right tools, at least on OS X. I suspect that options are available for Windows too. For example, you can use Hazel to copy scans to your own cloud folder. You can use folder actions to email scans to any address you want. And you can also use those tools to move files to other computers or users. I have hooked the the iX500 to a desktop. I can scan using the USB. When I unplug the USB and hit the scan button it doesn’t do anything. If I remote into the desktop computer and right click and do the Simple Scan it works. Why won’t the button work wirelessly? 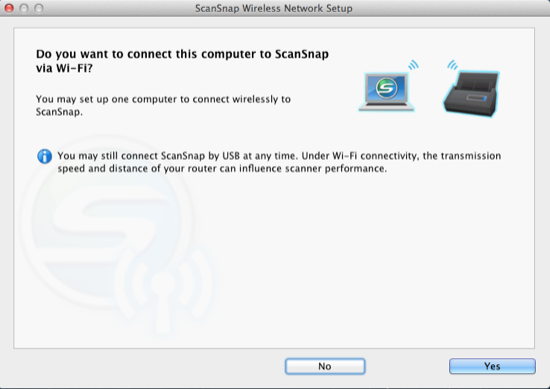 I apologize for the really dumb question but those that can’t scan to wifi when unplugged – is the wifi network set up in the ScanSnap Wireless Setup Tool? I have the same problem. No matter if it is USB or Wifi connected, it will not scan to my server unless I manually log into or remote desktop into the server. This is frustrating, as I want to either have more than 1 PC that can connect wireless at any time, or have it permanently connected to my server so that the whole family can use it when I am not home and have my laptop with me. The drive it is scanning to is synced to all PC’s via Dropbox. It would be great not to have to have the family to remote into a server that I dont want them touching, or having to manually plug in a USB cord to their PC’s / notebooks just to use a “Wireless” scanner. Leaving Wi-Fi aside for a minute, you mean if the scanner is connected by USB to the server, you can’t just press the scan button on the scanner and have it scan to a Dropbox folder? What happens? Is ScanSnap Manager running on the server? If the server/computer is on and the software is running and the user running the software is the active user (that is, the computer is not on the login screen or switched to another user) then, and only then, can you scan. If you have everything running and switch to another user account or switch to the login screen (as is normal for shared machines and servers) then you cannot scan. ScanSnap Cloud might be useful if available to the rest of the world. The whole point of having a server is to let it run in the background, along with all the other applications. It has no active user, which means using the scanner is difficult and pointless without moving it around everywhere. Wish I had known this before outlaying $550 for a useless “wifi” scanner, that needs to be moved around like a $100 scanner does. This has been a constant source of irritation with the Scansnap. The cloud scanning works for me, but this is a very recent change after years of having to run around, “Oh, you want to scan? Let me go make sure the right account is logged in to that machine.” Sigh. And cloud scanning is still rather limited in availability, isn’t it? Anyone solve the issue of the scanner dropping off the Wifi network? Keeps disconnecting then reconnecting – goes on forever. I recently purchased the iX500 scanner. I lose connection to the scanner intermittently. When I first start my computer up, it connects, then after awhile, it will lose connection and then reconnects again after awhile. The scanner is always connected to the router as the blue light is always on. If I use my iPhone, I do not have an issue. This is on windows 8.1. After I had this issue, I tried using my Mac and the Mac had the same issue. Any help is much appreciated. Also, how do I know if I have the most up to date firmware on the scanner? Thanks. I have the same issue. Did you ever find a solution. Anyone else have ideas? The one thing I want to do with the ix500 doesn’t seem to be something that can be accomplished in the standard settings. I’d like to scan (over WiFi, preferably) to a network folder unattended – meaning I don’t want to have to reply to any dialogs on a computer. I have document management software that can then check the folder for new files and process them based on a variety of rules that I have setup. Any thoughts on accomplishing this? You may be able to. Mac or Windows? Multiple variants of Windows. Network share (4TB DroboShare) set up as a Samba share. I’m also super interested in doing this! Any help you can offer would be awesome. JFYI, I’m on Mac OSX 10.9.4, but want to drop scans from the wifi connected ix500 straight to a folder in a network SMB share (or AFP) share. Paul, set up a ScanSnap Manager Profile to scan to a folder, and if you want it to be totally background, check out this post: http://scansnapcommunity.com/tips-tricks/10416-how-to-do-background-scanning-on-a-mac/. If only I could get this to work. “Connect by Wi-Fi” is always unavailable in the menu. Can’t find any troubleshooting on this from Fujistsu, everything there is about connecting via USB. Computer and scanner are on same wifi network, on same SSID, but nothing seems to work. I am having the same issue. The “Connect by Wi-Fi” is not available to click on in the menu, and can find any solutions to this anywhere. I did the online update and then nothing showed up. Now if I try it again it gives me an error message that reads “the ordinal 32 could not be located in the dynamic link library….” Anyone else having this problem or have advice? I have a ix 500 scansnap for my office. I have connected to the server and is accesible through my server computer. Howerver, I have 3 other terminals and I ma unable to access scansnap through the other terminals. WOuld be grateful for any advice. Hi Sid, I don’t know of an easy way to do it. Check this post for more information: http://www.documentsnap.com/scansnap-ix500-switch-computers-wifi-scanning/. Hm hadn’t heard of that one. Do you mean when you have the cable plugged in, the little S in the bottom right has the wifi icons, but when you unplug the USB cable the S icon disappears altogether? Is it there if you click on the little triangle? I am having the same problem as Laura. i go through the wireless wizard and get connected to wifi, but as soon as i unplug the USB cable, my laptop thinks ScanSnap is disconnected – i get the S logo with the red circle and line through it. I’ve restored to the factory settings. Nothing seems to work. i’m on Windows 8.1 – not sure if that matters. Checked Fujitsu website for driver updates, but there aren’t any. Thoughts? Massive update! This was really annoying me. Thanks for putting this update on our radar! The multiple computers tip is getting a page not found??? That is so weird. Not sure what happened there, but it is fixed. Thanks for letting me know! Just a note: if you installed your drivers from the online support site, and did not use the install CD, you may not have the online update feature (it will indicate the program is missing when you try and run it). There are two sites, one for Windows and one for Mac, that you can download and install this program from. This will allow you to follow the rest of the instructions found above. This held me up for a bit, but once I installed the online update application, everything worked perfectly. These are directly from Fujitsu. Very good update but I miss wake on demand in order to place the scanner anywhere in the house without having to wake the computer manually. Any other info on benefits from the update? Are there bug fixes? interface improvements? any new features other than the wireless scanning? Okely dokely, here is how to switch computers: http://www.documentsnap.com/scansnap-ix500-switch…. Yesss, finally. This is basically the only drawback to having a scanner since I'm short on USB connections at the moment. So glad that there is finally real wifi connection for computers. Can't wait for your tutorial on the multiple computers set-up. I have been so waiting for this feature!!! Thanks for letting us all know!!! I second that. I'd love to be able to set it up on my husband's laptop as well. Looking forward to your post on scanning to multiple computers. Thanks, I hope to have a video up tomorrow taking you through it. It's not hard or anything but there are some steps you need to do. I am having problem with Wifi connection between my Mac and Scansnap. Soon as I disconnect the USB connection, the blue light stays on but the connection is lost. Each time I install and install, it works for a while but then the Wifi connection is lost (seems after I shutoff and on my computer, so I have to connect back the USB cable. I chacked for updates also. What is going on? Seems so spoky ! Same issue as Hassan — loses wifi connection after just a few minutes. Works fine until then. Connect by wifi menu item doesn’t show the device any more after that, ever with Refresh. Help!